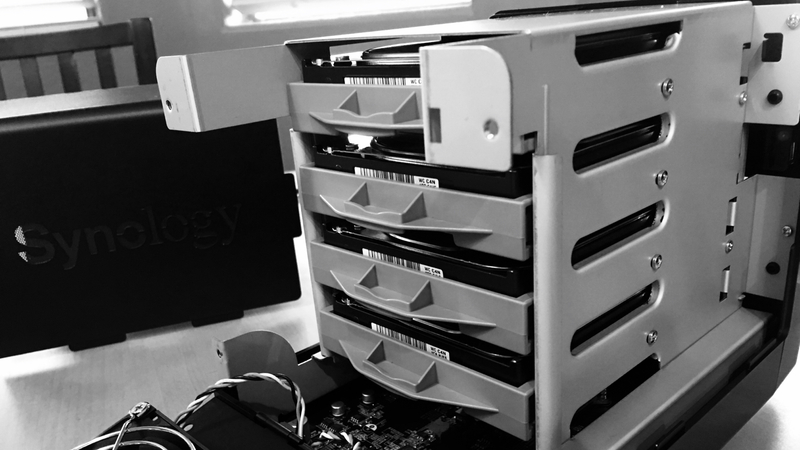 Synology DS416j loaded up with drives. I’ve been meaning to buy a NAS—a small, specialized computer that serves files—for years, but have always been put off by the cost. This is the Captain Samuel Vimes ‘Boots’ theory of socioeconomic unfairness as coined by the late great Terry Pratchett. Meaning I kept blowing money by buying external USB drives to hook up to my computers and then replacing them as they invariably died early deaths instead of making one larger investment. A NAS means paying more upfront and then making it back over time as you spend less for upkeep and getting built-in redundancy so if one drive (or two, depending on how you’ve set things up) fails you can replace it and keep on trucking without data loss. The DS416j is a great deal: Around $290 from Amazon for a four-drive NAS running the very good and n00b-friendly DiskStation Manager operating system. Of course, at that price Synology had to make trade-offs. The DS416j is expressly designed for light home use. If that is what you’re looking for, I wholeheartedly recommend it. If on the other hand you want a NAS for your office, you’ll be unhappy with this device. One gigabit Ethernet port only, so there’s no link aggregation—gigabit is as fast as it gets. 512MB of RAM, which is even less than Apple puts in its products. No support for hot-swapping drives. If you need to replace a drive, you’ll have to power the Synology down and break out your screwdriver. Like an animal. For a home server that costs less than $300, these are perfectly valid trade-offs. For a business NAS with 50 people on it, they are recipes for misery. Thanks to the maturation of the software on NAS devices these days, people are using them for all kinds of tasks apart from backups and media drives, which is great. But know that the DS416j comes with an Armada ARM chip, which is not particularly studly. This means two things: Any third-party software you want to use has to be compiled for that chip, and it plain doesn’t have a lot of muscle. The DS416j could perhaps be used as a Plex server. Maybe. For some files. And I’m not going to test it myself. Why? Because I don’t want to pop my popcorn, grab a chilled beverage and sit down to get entertained, only to find that whatever media file I happen to be interested in pushes the little Armada chip to a nervous breakdown. In a few years Moore’s law guarantees that whatever NAS you buy will be able to transcode anything you throw at it, but that’s a few years out. It’s important to note the NAS itself is only a container for drives, and you need to pay attention to the drives. You need to buy drives tuned to live in the cramped, hot, 24/7 environment of a NAS. After some research I decided the sweet spot for my usage was the 3TB Western Digital Red, so I picked up four of them from Amazon and they cost more than the DS416j itself. It’s kind of nice that when the drives are under load, their thrashing sounds like rain. It’s soothing. If you’re in the market for a NAS, Synology makes good ones, and the software especially is impressive. If you’re in the market for a light-usage home NAS that will be used mostly as a backup target and media file server, the DS416j is a nice product. Note: Amazon links are affiliate links. If you purchase something through them I get a tiny kickback. It doesn’t cost you anything.